Official synopsis: "Adelina Amouteru is a survivor of the blood fever. A decade ago, the deadly illness swept through her nation. Most of the infected perished, while many of the children who survived were left with strange markings. Adelina's black hair turned silver, her lashes went pale, and now she has only a jagged scar where her left eye once was. Her cruel father believes she is a malfetto, an abomination, ruining their family's good name and standing in the way of their fortune. But some of the fever's survivors are rumored to possess more than just scars-they are believed to have mysterious and powerful gifts, and though their identities remain secret, they have come to be called the Young Elites. Teren Santoro works for the king. As Leader of the Inquisition Axis, it is his job to seek out the Young Elites, to destroy them before they destroy the nation. He believes the Young Elites to be dangerous and vengeful, but it's Teren who may possess the darkest secret of all. Enzo Valenciano is a member of the Dagger Society. This secret sect of Young Elites seeks out others like them before the Inquisition Axis can. But when the Daggers find Adelina, they discover someone with powers like they've never seen. Adelina wants to believe Enzo is on her side, and that Teren is the true enemy. But the lives of these three will collide in unexpected ways, as each fights a very different and personal battle. But of one thing they are all certain: Adelina has abilities that shouldn't belong in this world. A vengeful blackness in her heart. And a desire to destroy all who dare to cross her." As a fan of Marie's previous work, the Legend trilogy (although I do still need to read the final book, Champion), I had an inkling that I was rather going to enjoy this book. And I wasn't wrong. The Young Elites is, I will go as far to say, Marie's best work yet. It is, quite simply put, incredible. The pacing. The action. The darkness. The world. The characters. It is all balanced so, so well and I couldn't get enough - I just did not want the book to end! It follows Adelina, a malfetto, marked by a blood fever that swept across the land claiming countless lives and leaving the survivors marked in some way. But as the years went on, it became apparent that those marked also had the chance to have unexplained powers. Control over fire, control over animals, control over the wind, super speed. Even, or so it has been rumoured, the ability to bring the dead back to life. Adeline discovers her power on the same night that her father dies and she is blamed. He's mistreated her her whole life, showing his love on his un-marked daughter, Violetta, always saying just how worthless Adelina is, but she isn't as worthless as he might think. She is an illusionist, able to conjure up images of terrible demons and more besides. Accused of murdering her father, Adelina waits for her execution and when the Lead Inquisitor, Teren, shows up she wonders why. Just at the last moment, as Teren is about light the pile of wood at Adelina's feet to begin her execution, she is saved and weaves an image to help her saviours. Rescued and carted off to a mystery room, Adelina wonders who has saved her and soon comes to learn that it is the Young Elites. A band of malfetto's who have joined together to help end the tyranny of the king and the persecution of all other malfetto's who are only tolerated in society, looked down upon. The Dagger Society trains Adelina to use her powers, to grow into them, but Adelina is hading darkness inside of her, a darkness that swells and grows as the book goes on and could spell disaster. As Adelina struggles with choices between right and wrong, choices that benefit only herself or those that would benefit countless others, things only get worse and build to a stunning conclusion. 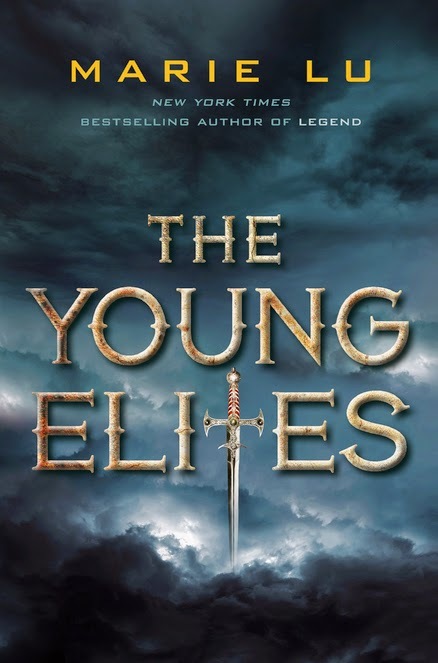 What I really love about The Young Elites is that it isn't a story about heroism. Oh no. There are no heroes here. Both sides do terrible, depraved things to further their own means. This isn't really a story about right and wrong. It's about doing what you have to do to get what you want. It feels so refreshing to read - normally we are always on the side of the good guy, reading along as they battle forces of great evil and darkness. Whereas with this book, we're instead alongside Adelina who isn't really sure what side she is on, isn't really sure what she wants and cannot help but feed the darkness inside of her, poisoning her own mind. I cannot get over just how awesome this book is. The characters really are a great bunch. From Adelina, to the dark, brooding Enzo. From Teren and his Inquisitors of the Inquisition Axis to Queen Guiletta and her dark, snake like charm, plotting against her husband, the King. I was so addicted to this book and in love with it - literally a perfect read! The only reason it isn't included in my end of year list for last year is because I had already completed and posted the list before I finished reading this book! Otherwise it would be there for sure! It even has LGBT characters and relationships in it with such a casual air to it that it's just normal. It isn't important to the characters that they might be gay or bi, or whatever, it's just how they are and it's fine, accepted. This was a breath of fresh air too as all to often the fact that a character is LGBT is the main struggle, whereas in this book it takes a back seat and isn't so much a plot point, more just a character trait and it is handled so well that I almost glanced over it every time it popped up and wouldn't of taken a big of notice had I not realised and said BUT THIS IS YA! LGBT IS GROUNDBREAKING STUFF, THIS IS GROUNDBREAKING STUFF... FANTASTIC! And with the way it's ended and the hints at the end, I'm pretty sure we are going to be seeing more of it! And the writing! I knew Marie's prose were great but this one just knocks it all out of the park. The narrative is perfect, Adelina's voice is so convincing and real you cannot help but feel her fear along with her. It is a cracking read and damn well hard to put down. I cannot recommend it highly enough, and with it being the last book I finished in 2014, I cannot think of a better read to end the year on! I loved it so much and I cannot wait for the sequel, which we now know to be titled The Rose Society! It's out in October and I cannot freaking wait!!!! With such a dark and foreboding looking cover, I'm glad the story met that mood. I've not come across this one before, but it sounds like just the sort of thing to put on the TBR pile!